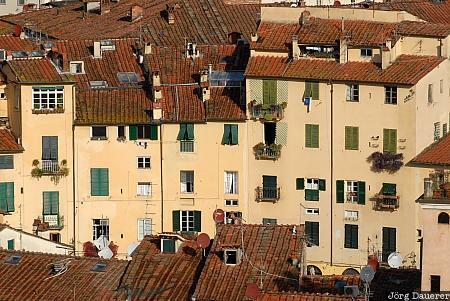 The buildings of Piazza dell' Anfiteatro - a place that is built around an old Amphitheatre - in Lucca seen from Torre Guinigi. Lucca is in northern Tuscany in the central part of Italy. This photo was taken in the morning of a sunny day in October of 2009. This photo was taken with a digital camera.